"Four different kinds of beans baked with molasses. I have substituted different kinds of beans and enjoyed all of the results. Use whatever kind of beans you like! I have also used Canadian bacon instead of regular bacon." 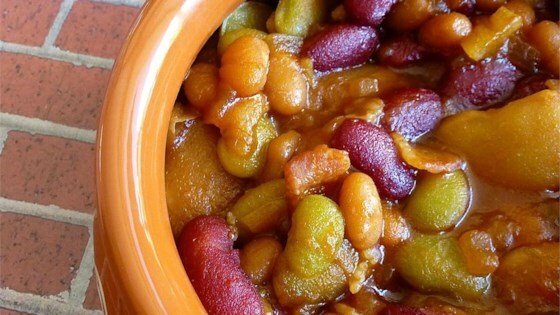 Place kidney beans, butter beans, lima beans, and pork and beans in a 2-quart casserole dish. Heat a saucepan over medium heat; cook and stir bacon, onion, and garlic until bacon is browned, about 10 minutes. Pour off excess fat. Whisk brown sugar, ketchup, vinegar, molasses, and mustard into bacon mixture; simmer until cooked through, about 20 minutes. Pour sauce over beans in the casserole dish. Bake in the preheated oven until bubbling, 1 hour 15 minutes. This is one of the best baked beans recipe. I have made this plenty of times and never have any left. Numerous requests for this recipe. Thanks for sharing. Delicious! I assembled a day ahead, and cooked the next day on high in the slow cooker for a large gathering. Made dinner a breeze, and was asked for the recipe by many people. great recipe! Excellent bean casserole. I added about 1/4 cup of Jim Beam. I would probably cut back on the vinegar a little next time I make it. Definitely will make again. I followed the recipe exactly. Got so many comments on how good they were. First dish to empty. Very easy recipe so I am filing this one!